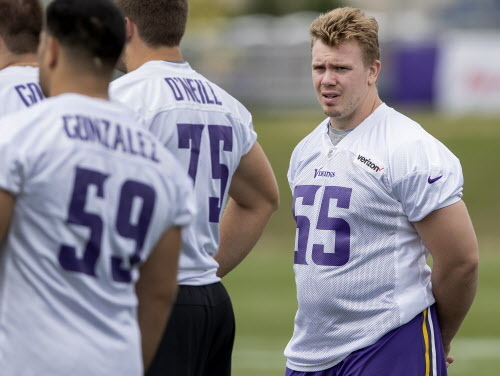 Vikings center Pat Elflein, who was placed on the physically-unable-to-perform list to begin training camp on Wednesday, is recovering from not one, but two, operations he had this offseason. Multiple NFL sources said Elflein had surgery this offseason to repair the shoulder injury he’d sustained last Dec. 2 in Atlanta. Elflein missed two of the Vikings’ last four regular-season games with the injury before returning for the team’s two playoff games. Coach Mike Zimmer had said in January that Elflein would have offseason surgery on the left ankle he fractured in the NFC Championship Game, and Dr. Robert Anderson performed the operation shortly after the season. I’d heard all offseason that Elflein had also needed surgery on his shoulder, and sources said Wednesday he did in fact have an operation. Zimmer said Wednesday that Elflein would be on the PUP list “until he gets healthy and the doctors say he can go,” before adding, “It shouldn’t be too long. He is getting better every day.” Elflein isn’t dealing with a new injury, and his recovery from shoulder and ankle surgeries would seem to be reasons for caution more than concern at this point. The shoulder operation does explain part of the reason, though, why the Vikings figure to take their time with their second-year center and make sure he’s completely healthy before engaging in full-team drills. The Vikings signed rookie center J.P. Quinn on Tuesday, before placing Elflein on the PUP list Wednesday. Elflein would need to be cleared from the PUP list before he can take part in team drills in training camp. Rookie fourth-round pick Jalyn Holmes showed up to Vikings camp with a healthy right hand, marking a solid first step in his transition this summer to defensive tackle. The former Ohio State defensive end gained five pounds, up to 290, during his month away from the team. Two weeks ago, the cast came off Holmes’ hand, allowing him to practice at the start of camp without a hitch. Once the full team reports Friday, Holmes has a chance to compete for an interior rotational spot behind starting defensive tackle Sheldon Richardson. Kai Forbath is scheduled to arrive to Vikings camp on Friday, with the rest of the veterans, but unlike most established starters, he’ll have a young fifth-round draft pick gunning for his job. Daniel Carlson started camp on the right foot, clearing the uprights on all six extra-point-range field-goal attempts from about 30 to 35 yards away. Carlson, the highest-drafted kicker in franchise history, said he’s feeling more excited than nervous heading into his first camp. Only about 5,000 free tickets remain for select dates during the first Vikings training camp at TCO Performance Center in Eagan. About 80,000 of the available 85,000 have been reserved, according to a team spokesperson. Fans can still reserve free general admission tickets for Thursday’s practice, featuring quarterbacks and rookies, as well as the full team practice on Tuesday, Aug. 14. Reserved seats, costing $20 to $25, are still available for most camp practices through the Vikings website at Vikings.com/trainingcamp.